About a month ago, we gave you our first 4 tips and warning for shopping. Now, we have more to add. The summer is prime time for shopping, and we want to be sure you're all set when it comes to navigating deals and retail outlets. 5. Be careful with "deal" websites and emails. You decide what you want and when....not emails or pop-ups. A lot of stores and e-commerce shops send emails with promotions and deals. These are great if you're looking for something--but if you're not, they can lead to unplanned spending and impulse buying. Be careful succumbing to deals. If you don't need to spend money, don't! 6. Sell or donate first. If you feel the urge to shop, but want to keep your closet space in check, or even just balance the incoming items with outgoing, make some donations. Shopping can be the gift that keeps on giving. Whether you like donating to entities like Goodwill, the Salvation Army or Purple Heart, or smaller organizations, take the time to pass on your good fortune to others. Your items can gain new life in the hands of someone who needs them. You can feel good about giving and enjoy your new stuff. Win-win. Also, check out our suggestions for Where Fashion Meets Charity and 5 Ways to Give, Fashionably. 7. Buy clothes fit for any day of the week. Of course we all need items for special occasions, but for the most part, you need staples and everyday pieces in your wardrobe. Ladies and gents alike need to have things they can wear in a variety of ways and for as long as possible--whether dressed up or dressed down. 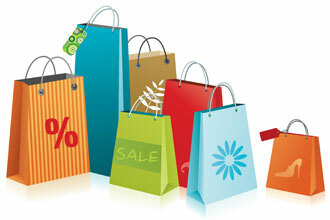 When shopping in general, think about how many different ways you can wear or use what you're purchasing. You'll get more for your money. 8. Don't always trust the setting in the store. Stores are designed to make you want to spend. Things are carefully placed, and the decor is all done with purpose. When buying shoes, be sure to walk in them on the carpet and tile floor (if possible) before buying. Carpeting makes shoes feel comfortable, but in many instances, it's not the only floor type you'll encounter once you buy those shoes. Also, check out how things look on you in different lighting. This will let you know if the colors and fit are genuine or not. Step out of the dressing room into the big mirror and better lit space to really see how items look on you. *If the store you're in doesn't have a variety of conditions, don't stress, you will likely be able to make returns if you get home and are unsatisfied. We hope these tips are helpful to you.